How vibrant is your creative economy? 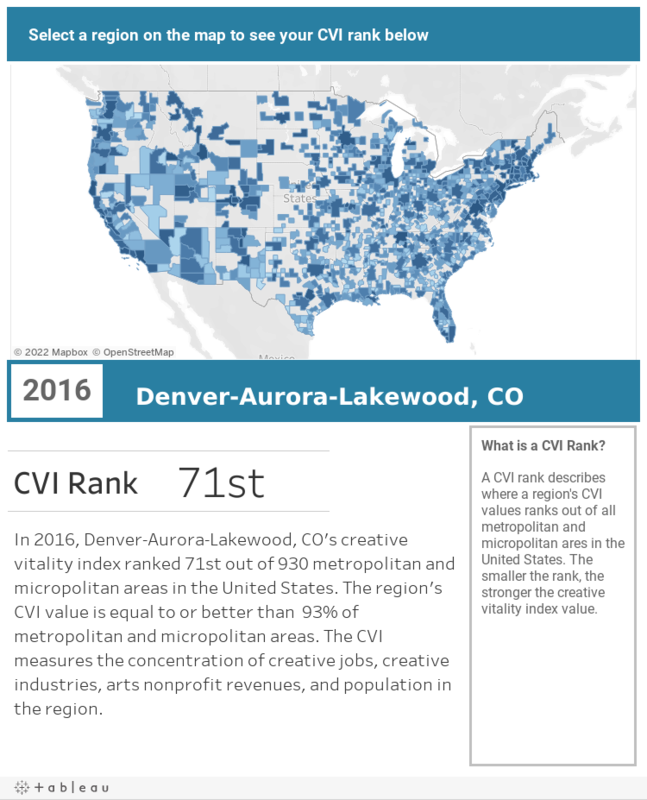 The visualization displays CVI ranking among all of the metropolitan and micropolitan statistical areas within the United States. for a region of your choice! * regions limited to states, counties, metropolitan statistical areas, or micropolitan statistical areas. The Index includes indicators from the for-profit and nonprofit arts sectors. Sixty percent of the CVI measures arts participation from industry sales and nonprofit revenues. The remaining forty percent is attributable to creative occupation jobs. The CVI Rank sorts all metropolitan and micropolitan CVI values from highest to lowest. The smaller the rank, the stronger the region’s CVI value. Vineyard Haven, MA, Summit Park, UT, Jackson, Wy, Sante Fe, NM, Glenwood Springs, CO, and Washington-Arlington-Alexandria, DC-VA-MD-WV ranked the highest in CVI values in 2016. These cities had very strong creative activity concentration per capita. Note: Data is sourced from CVSuite’s 2017.3 data version.